ONI Bureau: The Odisha Government on Tuesday said it would celebrate the 150th birth anniversary of Mahatma Gandhi for two years starting from October 2 this year. 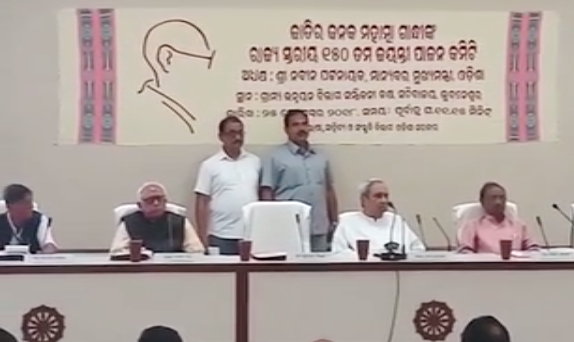 This was decided at a meeting chaired by Chief Minister Naveen Patnaik in the presence of former Chief Minister Giridhar Gamang, Leader of Opposition Narasingha Mishra and Culture Minister Ashok Panda, among others. “Achieving independence was not the sole aim of Gandhiji. He had the prime objective to develop the fundamental value in Indian society. Gandhiji’s two mantras — truth and non-violence — have relevance in the present-day society,” said the Chief Minister. Patnaik said he has proposed to include ‘Ahimsa’ in the preamble of the Constitution. “A total of four sub-committees will be formed for the Gandhiji’s birth anniversary celebrations. Padayatras (foot-marches) and memorial meetings will be held across the state,” said the Culture Minister. It was decided that the birth anniversary of Gandhiji will be celebrated in all schools, colleges and government offices on October 2. Besides, it will be celebrated in all urban local bodies, blocks and panchayats. A new website will be opened to propagate the messages and life of Gandhiji. “Kasturba Gandhi Ideal Schools will be identified in each block. Those with notable works in the field of cottage industry will be awarded. A special session of the Odisha Assembly will be convened in 2019,” said Panda. Commemorating the first visit of Mahatma Gandhi to Odisha, a function will be organized in Cuttack on March 23. Besides, the statue of Mahatma Gandhi will be put up in all district headquarters as well as places where he had visited while one major road in the districts will be named as Mahatma Gandhi Marg.